Book your cheap holiday to the Algarve and get ready to enjoy the Mediterranean sun in Southern Portugal. Faro airport is by far the most popular airport in the Algarve region, with discount airlines flying to the Portuguese city at all hours of day and night. Once you have arrived in Faro, it is extremely simple to make your way to whichever resort you have chosen to visit in the Algarve. Buses and trains run between most of the major cities, but taxis are cheaply priced and can be booked in advance of arrival, making them an easy and popular option for many tourists. Car rental services are also available from Faro airport, if you would prefer to explore the Algarve at your own leisure. Those who wish to avoid the roads entirely can make use of the extensive train network which joins the Algarve’s towns and resorts. Tourism is the Algarve’s main industry, meaning that holidaymakers are well catered for all year round. The region is known for its cheap costs, with even those on limited travel budgets able to enjoy a thrilling budget holiday. Food and drink flows freely in the Algarve’s numerous bars and restaurants, with quality produce available for extremely reasonable prices. 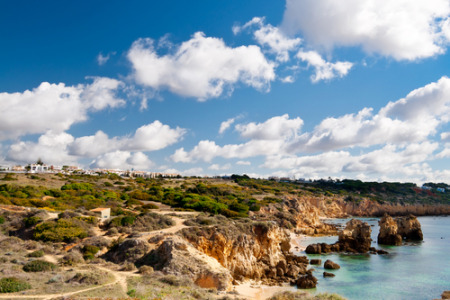 Holidaymakers looking to enjoy the local ales can even visit the town of Sagres, where the famous Portuguese beer of the same name is manufactured. Whatever your tipple, the plethora of bars littering the golden coastline will quench your thirst. You will not be disappointed when searching for mouthwatering meals to accompany your refreshments, with the Atlantic Ocean providing plentiful portions of fresh fish. There are cheap seafood restaurants along the Algarve coast, with some beach bars even barbequing on the sand; fresh sardines barbequed in front of your own eyes is a simply unbeatable culinary experience and one which every seafood-lover should enjoy at least once when visiting the Algarve. It isn’t all seafood restaurants, however, with the Algarve specialising in the famous Portuguese piri piri chicken. The spicy pepper sauce is renowned worldwide for its intense flavor and pleasant heat. You can find food coated in piri piri sauce in most Portuguese restaurants, and it should be tried at least once for a truly authentic holiday in Portugal. Golfers will already be extremely familiar with the Algarve, as the region is home to 30 different courses, ranging from cheap courses for amateurs to seriously challenging courses for seasoned pros. These courses have helped make the Algarve one of the most popular golfing destinations in the world. If you are looking for somewhere to enjoy a relaxing round of golf while on holiday, you really should look no further than this strip of the Iberian Peninsula. If golf isn’t your sport of choice, you could enjoy one of the 30 hiking trails in the region, or even cycle the coast, taking in the breath taking vista views as you travel. The Algarve is one of the most popular tourist destinations on the Iberian Peninsula, largely due to its vast expanses of glittering, golden beaches for tourists to enjoy. 100 different beaches stretch across 200km of the Portuguese coast. It is these glittering golden beaches that really draw the crowds of holidaymakers, but as there are so many scattered across the coast it can be extremely simple to find a hidden gem in a more secluded spot. It is your holiday and the choices available ensure that it can be as relaxing or as exhilarating as you wish. How you choose to experience the Algarve is completely up to you; from sunbathing on one of the sandy beaches as the waves gently caress the golden shore, to taking in a race at the Autódromo Internacional do Algarve in Portamao – the famous Portuguse Formula 1 testing track, complete with its own five-star hotel and sports complex. We can help you find the perfect holiday for whatever budget you are working to. Simply click on our handy search tool at the top of this page and choose when you would like to visit the Algarve and you will be on your way to booking a cheap flight today. Top 6 Easter Holiday Deals - Who needs chocolate eggs when you've got so much sunshine!